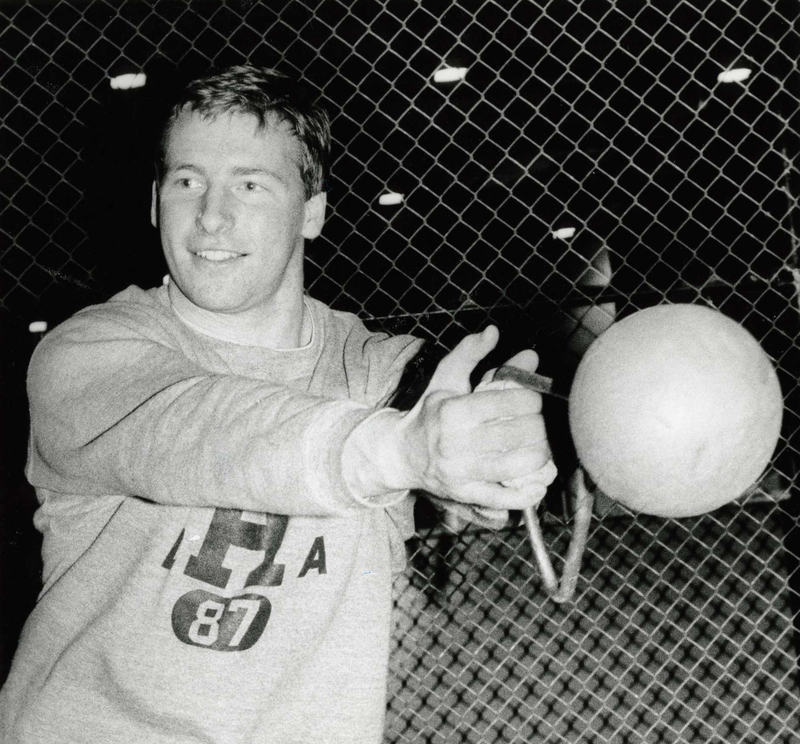 James won the Heptagonal Title in the 35-pound weight throw in 1988. In his four years at Harvard he earned six berths into the NCAA championships. He is still the recordholder in the 35-pound weight throw with a throw of 64' 8.75" in 1987. He also earned All-American honors in 1987 and was the Bingham Award winner in 1988. To put the hammer throw in context, it helps to say that Henry the Eighth swung a hammer... among other implements! It's an odd sort of sport, banished to the outbank of stadiums, more Celtic than Greek. Ireland has a long history with the sport and spawned an Olympic champion in 1928 and 1932. The fields always seemed greener though across the pond, and Harvard has landed its fair share of imports. My first direct experience with Harvard track and field was in 1982. "Chips" and "Dallas" were playing at the time. Sunglass-donning, crimson-clad athletes got off the bus in Belfield, Ireland; I proceeded to get their every autograph. It was also my big introduction to the coach, Frank Haggarty, the Head Dude. We shook hands as he rolled on his back- I thought this must be a Harvard thing (his hurdling related spinal injury was acting up). With guidance from my BU educated secondary school coach Philip Conway, I made the case to Harvard, Yale, and other colleges. The decision was made on a bus when, after my mom proudly declared to Barney the driver of my acceptance telegrams, he noticed he'd heard of Harvard but, "what part of Dublin is Yale in?" In 1984, no less that five varsity-aspiring throwers queued for our US visas before spinning off to various American colleges, all of which curiously had coaches with Irish last names. On arriving in the States, I was quite struck by the profusion of hammer cages doted at every park between Logan and Lionel. The revelation that these were, in fact, baseball cages began what is now twenty years of explaining the medieval sport. Frank was the one constant at Harvard. Professors may come and go, but Frank was always there. Of course, McCurdy was omnipresent. He told me of (ex-throws coach) Stowell's immortal words to a thrower: "why don't you just throw further." Throws coach Al Bashian signed on to the program with me in '84 and together we pulled off four good years. In truth, it didn't take much to pull many of us across the Charles Swaddled in dHa sweats, the Dillon Field House took care of us like mother - the only requirement was to show up. Then there was the fellowship; this is where I met my roommates, mentors, teammates, girlfriends and wife - all jocks to one degree or another. With each of us grinding away at different pursuits in Cambridge, Allston provided common turf. At "meets" (the T&F term for competitions) we freshman moticed the same faces showing up again and again. These were the "Friends." John Thorndike led the stalwart cheerleaders at the throwing events. Only after graduation, did I fully realize that after the brief corporeal life in Cambridge, we older Soldier's Field athletes never die, we just become "Friends." then and now, John and the phalanx of friends provide the tangible link between the generations of throwers, each parsed and graded by year of graduation and distance tossed. That freshman year, Hall of Famer Steve Ezeji-Okoye led us to victory at the Indoor Heps. Perhaps the following experiences will describe Harvard T&F at its best. At the individual level, I qualified for the NCAAs a bunch of times and flew out to little towns in the prarie to compete. But these trips has an anti-climatic aspect; missing was the team camaraderie, cohesion and chaos. My most memorable competition was a two-bit indoor dual "meet" against Northeastern - a classic either side of the tracks match-up. As always, the 35 lbs. weight competition preceded the first cup of coffee so both teams had nothing to do but cheer on their mates. Harvard climbed the cate on the right side and Northeastern climbed the catge on the Left. The volume was deafening, the air palpitated; adrenalin pumped for throw after throw, round after round as we clashed in the arena. From Freshman to Senior, we did well that day knowing that our monkish pursuit was only as good as the support we got from our spiked buddies. And maybe that's the trick with Harvard Track; it's at its best when the distant runner, the jumper, the sprinter and the thrower all fight together. I congratulate my fellow '04 Hall of Famers; it is an honor to be in your company. I thanks the Varsity Club, the Selection Committee and footballer Bobby Glatz for this honor. So what will this induction mean? I hope it motivates the next kid to work hard and beat my record just as I tried to better the previous mark. I'll celebrate that. And closer to home, I have one hammer throwing god-daughter, two fast-twitch youngsters and three athletic nephews in New Hampshire who might feel inspired by all this to excel in their chosen sports.